Scoop.it, the startup that approaches Web content curation by letting you create a topic-specific blog-style feed that others can follow (see our initial coverage here, and more here), has launched an iPhone app that allows you to manage your topics on the go. While many mobile apps for curation services are simply designed to view content, Scoop.it is designed for sourcing and sharing too. For each of the topics you manage, Scoop.it will suggest recent articles from around the Web which you may wish to share. Each suggestion can be shared to your page or removed with a couple of taps. If you want to share something manually, meanwhile, you have two options; you can either enter the URL, title, and a note to go with it, or there’s a bookmarklet you can install to share easily from the iPhone’s own browser. Unfortunately, as with other iPhone bookmarklets, it’s a little fiddly to set up. This isn’t a failing on Scoop.it’s part though, more a problem with the way the iPhone works. 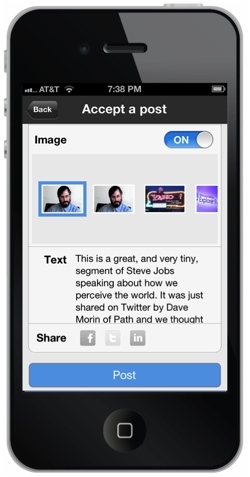 If Android-style links between apps were possible, you’d be able to share content from the browser to any app easily. As it is, these bookmarklets are currently the best workaround available to iOS developers. Scoop.it’s iPhone app doesn’t let you create topics yet, so it’s best seen as an accompaniment to the browser-based experience. 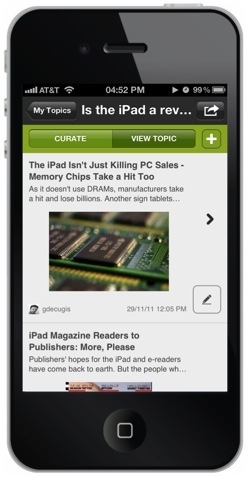 If you’re an avid Scoop.it user however, this app is ideal for sharing on the go.